Caught in a cosmic dance, our nearest neighbor galaxies, the Magellanic Clouds, are cartwheeling and circling each other as they fall toward our galaxy, the Milky Way. The gravitational interaction between the Clouds sparks cosmic fireworks—bursts of star formation as new clusters of stars flame on. How many and what kind of star clusters have been born this way over the history of the Clouds? A new project, the Local Group Cluster Search, invites citizen scientists to help find out! Close enough to see with the naked eye when viewed from the southern hemisphere, the Magellanic Clouds have interacted in multiple close encounters over the past 2 billion years. During the encounters, gravitational forces push and pull on gas in the Clouds, sparking the formation of many new star clusters—"families" of hundreds to millions of stars—each formed from a single cloud of gas and dust. These clusters are useful to astronomers because they can be age-dated with great precision and used to reconstruct a historical record of star formation. By counting the number of clusters as a function of age, astronomers can back out the birthrate of clusters and chart the interaction history of the Clouds. A new citizen science project, the Local Group Cluster Search, aims to do just that by coupling new, high-quality images of the Magellanic Clouds with a proven technique to find star clusters. The Local Group Cluster Search uses images from a new survey, the "Survey of the Magellanic Stellar History" (or SMASH for short). 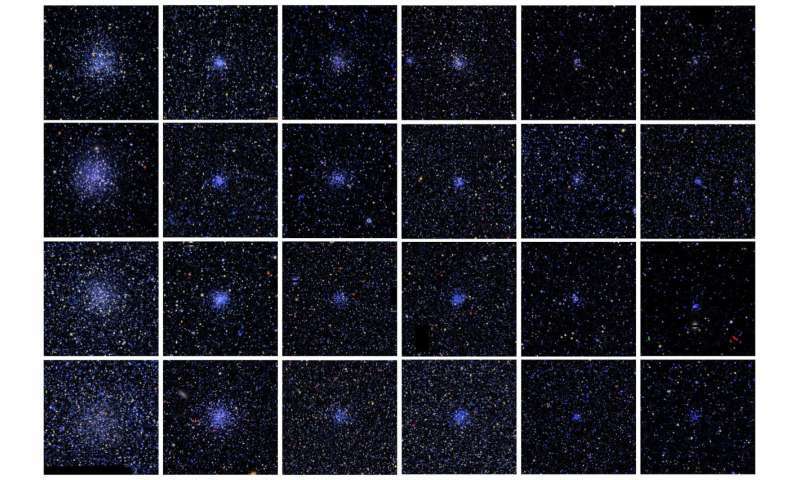 In contrast to the earliest studies of star clusters in the Magellanic Clouds, which used images captured on glass photographic plates, SMASH was carried out using the Dark Energy Camera (DECam), a 570-megapixel digital camera on the Blanco 4-m telescope at National Science Foundation's (NSF) Cerro Tololo Inter-American Observatory in Chile. Using DECam, astronomers obtained images that not only cover the full extent of the two galaxies but also are more sensitive to faint stars than any previous wide-field optical survey of the Clouds. Explaining the challenge of surveying the Clouds, David Nidever, an astronomer at the National Optical Astronomy Observatory and Montana State University who leads the SMASH survey, said, "The Large and Small Magellanic Clouds are huge on the sky, covering more than 100 square degrees—an area larger than 500 full Moons!" While it would take tens of thousands of tiled images from the Hubble Space Telescope's largest camera to image the full sky area of the Clouds, DECam surveyed the main bodies of both Clouds with its immense field of view in fewer than 50 images. Human Eye Still the Best! 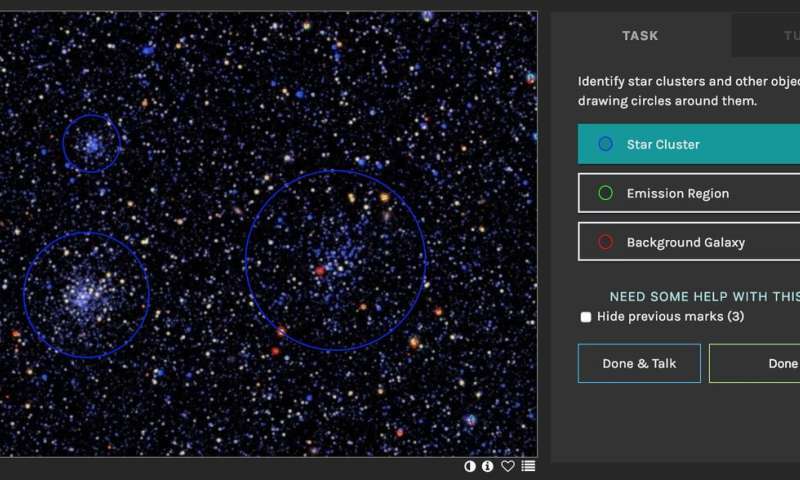 Hosted by the Zooniverse online citizen science platform, the Local Group Cluster Search asks volunteers to examine small portions of the SMASH images and identify star clusters by eye. Citizen science searches are a great way to catalog clusters, even in today's age of machine learning and artificial intelligence, because the human brain is highly skilled at pattern recognition. Cliff Johnson, a postdoctoral fellow at Northwestern University who leads the citizen science project, said, "While computer-based methods continue to improve, the varying backgrounds and appearance of star clusters in images of nearby galaxies make cluster identification difficult to automate. Algorithmic cluster searches have trouble eliminating false detections due to chance groupings of stars, while human-classified catalogs provide a reliable sample of clusters down to very faint brightness levels." Volunteer-led star cluster identification has a proven track record of success. In the earlier "Andromeda Project," citizen scientists identified 2,753 star clusters in the Andromeda galaxy. 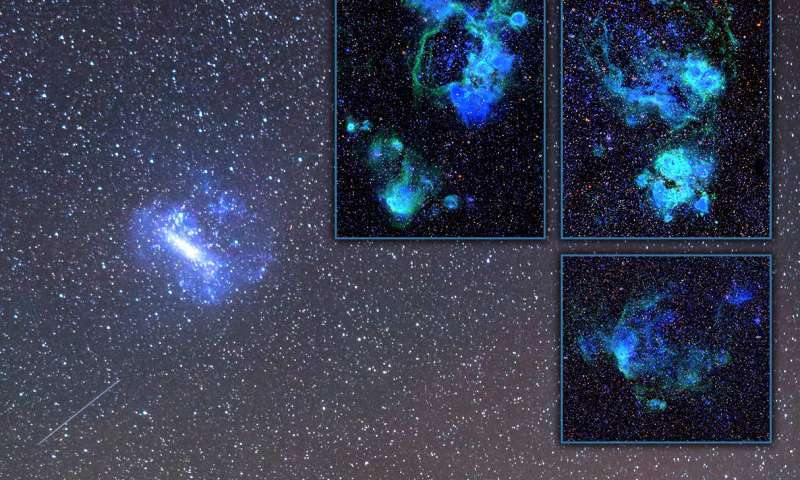 The results revealed that cluster formation varies with galactic environment. Through the Local Group Cluster Search, citizen scientists also recently completed a study of the Triangulum galaxy, identifying thousands of star clusters. With cluster censuses of Andromeda and Triangulum complete, the search now turns to the Magellanic Clouds, the only nearby galaxies yet to be searched by citizen scientists. What will the search reveal about the interaction history of our closest neighbors? Stay tuned! Join the search by visiting the project website at clustersearch.org .